A key part of the legacy of a creative momentum project is the evidence developed to shape future creative sector policy and support programmes in the partner regions. 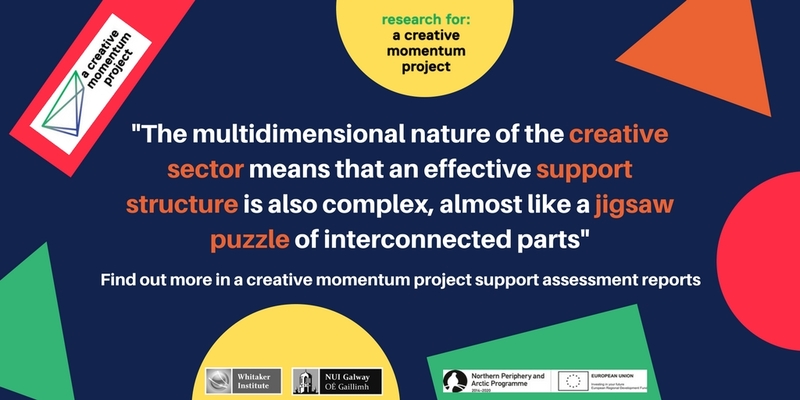 As part of the project, National University of Ireland, Galway has worked to analyse the creative sector and has prepared a series of policy reports. Here we focus on some of the key messages from two of our reports focused on the Northern Finland partner region. Two provinces, Lapland and North Ostrobothnia, make up the Northern Finland partner region. Data from OECD Territorial Reviews shows that North Ostrobothnia is smaller in land area, but has a larger population and is more densely populated than Lapland (410,000 versus 182,000 approx.). Natural resources provide an important source of economic activity in Northern Finland and the economy is specialised in the areas of mining and quarrying. Our analysis suggests the creative sector also has significant economic and social value in the region. 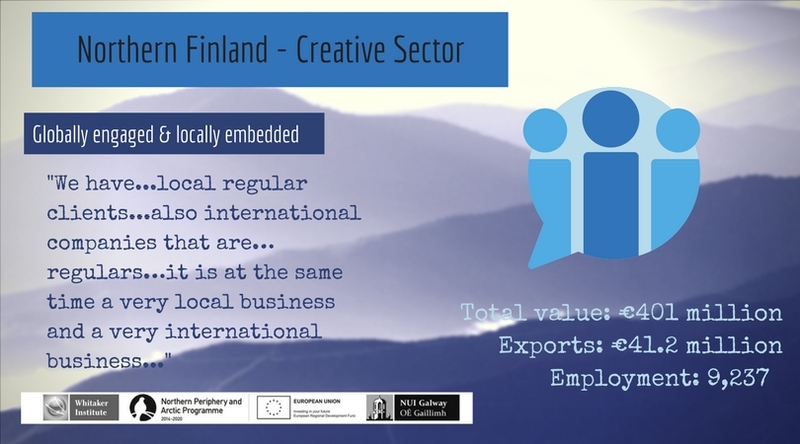 We estimate the total value of the creative sector to Northern Finland region at €401 million and value exports at €41.2 million. The sector is comprised of 2,298 businesses employing around 9,237 people. We also identify a range of wider socio-economic contributions from the creative sector in the region. The creative sector is locally embedded, yet globally focused. Our findings suggest that while the majority of spend (52%) by creative sector enterprises on goods and services is local, the sector is also globally engaged. 62% of our survey respondents in Northern Finland said they exported. Creative entrepreneurs also unlock value from local resources, such as heritage, traditions, landscape and nature, which inspire and fuel their creativity. These entrepreneurs are also an asset to the region. Their characteristics show an ability to change direction, adapt to serve new market demands, have a tolerance of uncertainty and determination to succeed. We also wanted to understand if threats face this sector’s continued strong impact and growth in the region. Our analysis found a range of creative enterprise support needs to facilitate future development. A core challenge for the creative sector in the region is access to finance. For future growth we find a need to examine the potential to develop greater synergies between creative sub-sectors and other industry sectors, as well as the potential for development of shared spaces, such as co-working hubs and business incubators. We also argue to increase export market access, barriers to exporting need to be addressed, such as better information provision on exporting and increased supports for network building in new markets.